Espectalium offers you a great variety of team building activities to develop positive social values like teamwork, group dynamics, companionship, etc. 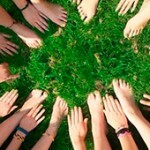 Learn more on how to hire team building activities for companies. We offer musical activities for companies. 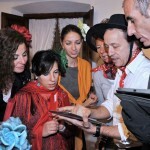 We have a wide variety of activities like workshops, recordings, gala simulations and music contests. Activities led by the best professionals in their respective fields. Activities that encourage fellowship. The best song contest for your event. 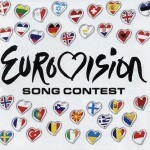 The contestants are divided in groups and each one of them has to represent a country and a song. Once they all have performed, each group has to give its scores. Twelve points go to…! An activity which consists in dancing a choreography in a public place spontaneously. An activity thought for a group of people with the desire to dance and have fun. We can shoot it for you. Lipdub is the perfect activity to make the members enjoy together. It consists on recording a shot following a route established previously in which its participants appear as the camera moves to the different locations. 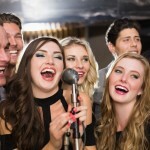 A musical activity which consists on recording a music video for groups. The participants must chose a song or compose one by themselves. Perfect promote a new campaign, product presentation, etc. Participants must choose a song and hop on stage where professional musicians will play as they sing. As they play, you’ll be able to read the lyrics of the song in a screen. Participants must prove their singing talent on the stage and later will receive the coaches’ verdicts by pressing the button in the case their performance was liked. Participants compete in a dance show with choreographies and spectacular costumes from the TV show “Mira quién baila”. This activity offers you a fun way to entertain any kind of event. Make your employees turn into professional dancers with the best teachers who have appeared in TV programs with this workshop. Learn how to dance this passionate dance with the best dancers. 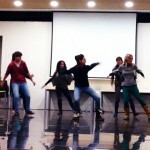 The teachers will show you how to clap (hacer palmas), footwork (zapateo) and a simple choreography. An activity full of art for companies. Body percussion is the art of creating sounds with your own body as if it was an instrument. A good way to work on the relationship and coordination of the members. 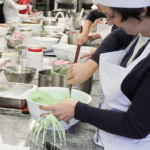 We also offer cooking activities for companies. 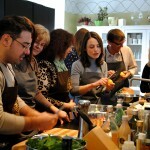 Food tasting, cooking workshops, etc. Activities taught by the best professionals. Activities to develop companionship, group dynamics, teamwork and relationship amongst employees. The successful cooking TV show for your company. A professional chef is in charge to explain the different dishes that will be cooked and in the end he gives his own verdict. 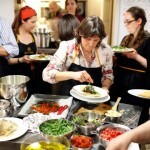 Each participant must learn how to cook different dishes. A professional chef is in charge to lead the activity. Participants must be divided into groups and once the dishes are cooked they can taste their creations. 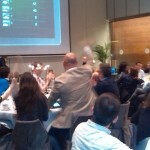 An activity which will bring your employees to the fascinating world of the elaboration of tapas. A workshop that will unveil all the secrets from Tapas. Interactive games are highly requested activities. They promote participation, teamwork and competitiveness. Interactive, fun and very original games. Success is guaranteed with these interactive games. We offer different activities for companies. Participants will have to investigate and resolve an assassination case. 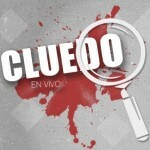 Activity based on the well-known board game Cluedo. An interactive game that will entertain all participants. Activity that takes place on the street in which participants must pass different tests. Get to know the city with the best gymkhanas. Leave the office to rediscover the city. Activity in which a master of ceremonies makes your employees the protagonists, including their personal traits in a fun and respectful way. Questions will be projected in a screen and a presenter will be reading them. The audience will be divided in groups and will have to answer correctly and fast! Enjoy. A great way to get to know your co-workers in a relaxing and festive atmosphere and to feel the company’s unity. Some of these themed nights we offer are Oscars night, Olympics, etc. , etc. 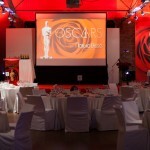 Dress up your event and transform your guests into real Hollywood stars. The audience will be divided into groups and will have to record an advert of the product of the company. During the dinner awards will be handed out. After the dinner the audience is divided into groups. 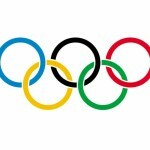 Each group will participate in different challenges inspired by the Olympics. In the end of the event, medals are handed out to the best teams. Participants play in the famous TV programme. They will have to sing in front of a panel of judges who will turn their chairs if they like the performance. In the end of the event the winner is named. 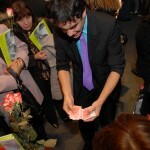 Activity for companies in which its employees will learn simple magic tricks and will have to perform them. A new experience for companies that will bring you to the fascinating world of magicians. Participants will work on concentration, attention, respiration and will be able to work on mental serenity, making the relationship of the team a better one. Feel part of a ‘colla castellera’ and learn the true values of teamwork and will feel the energy and feeling of realisation of building a ‘castell’. 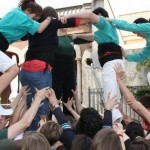 This activity is guided and supervised by real members of ‘collas castelleras’. 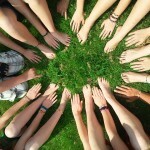 The Team building concept is very popular amongst companies. Meetings to strengthen the team’s bond and teamwork with activities in which employees will enjoy and will take a break from routine. These experiences are important regarding the company’s productivity and efficiency. Activities for companies are one of our specialities. In order to increase the productivity and efficiency, compenetration is one of the most important factors to take into account. This also helps to increase the benefits. The activities we offer for companies are fun and original. This is a good way to work on teamwork and fellowship as workers escape from routine. 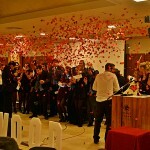 We work to offer you different activities: workshops, team buildings, interactive games, theme nights, TV shows and more. Don’t hesitate on hiring our services to create a better relationship between co-workers and a better sense of unity of the team. 5 activities for companies that you may like. More and more companies prepare activities for employees to disconnect from the daily routine and to get to know each other.